Here I started with Crumb Cake ink and Paper and the Color Coach showed Chocolate Chip as the monochromatic color balance for it. 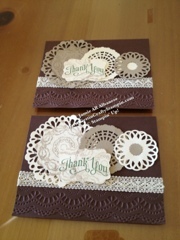 With our new Delicate Doily Sizzlits, the Big Shot and the Delicate Designs Folder helped to create this lovely card. I punched out the doilies in both both Very Vanilla and Crumb Cake. 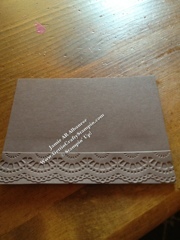 I ran the Chocolate Chip paper thru the folder to create the lacy edge. 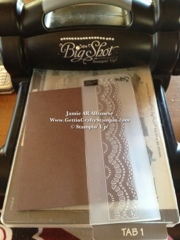 I thought the larger doily was too plain do I stamped, with Crumb Cake, the Gossamer Lace lil stamp. Sooo cute and it really tied it all together. The crochet lace ribbon we sell sealed the deal. 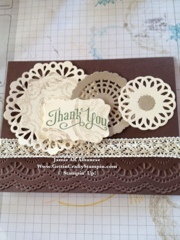 I alternated the doilies and created this card. I stamped the sentiment and punched it out with our Decorative Label punch. 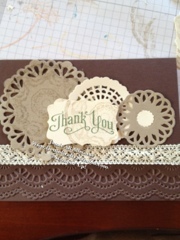 I stamped the Gossamer lace over the Garden Green sentiment from the Perfectly Penned greeting set. I hope you feel all lacy. I love this new line of lace and doilies, don't you?? 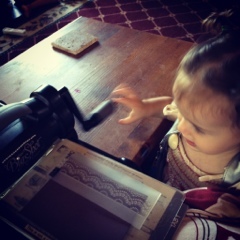 During convention people asked if Arabella helped stamp my cards. Lol. My 6yr old,Genevieve, and hubby pushed the lil chads out of the punched doilies with our stylus. My 4 yr old, Carina, ran about picking up the 45 cards worth of chads that ended up on the floor and not in my trash bibs. Lol. 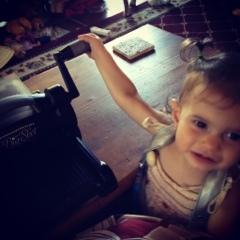 My 14 month old helped turn the handle on the Big Shot. My 8 yr old son, Sal, skateboarded outside telling me that this card was too girly. Lol. They all help, in their own way.